TOO MUCH WORDS. TOO MUCH SOUNDS. A SCREAM SINKS IN RINGING OF GLASSES, DRUNK LAUGHTER, ROAR OF ENGINES, CLATTER OF WHEELS. DECIBELS ARE BROUGHT DOWN ON ME FROM ENORMOUS COLUMNS. THERE IS A FEELING OF PLASTIC LIFE IN THE AIR. I SQUEEZE TEETH STRONGER. NOBODY NEED MY WORDS, NOBODY WILL HEAR THEM. ONLY PICTURE. HARDENED MOMENT OF SPACE. THERE IS NO REALITY IN IT. ONLY FEELING. CHARACTER SPACE. MY LOOK TO REALITY THROUGH THE GROUND GLASS OF CHAMBER. ONE BY ONE WITH THE WHOLE WORLD. ALL THAT I WOULD SAY – I TOOK OFF ON THE FILM. TIMUR SULEYMANOV IS A PROFESSIONAL PHOTOGRAPHER, HE LIVES AND WORKS IN PRAGUE, AT THIS TIME HE COOPERATES WITH SOME PUBLISHMENTS AND AT THE SAME TIME MAKES PROJECTS IN AREA OF ART PHOTOGRAPHY. 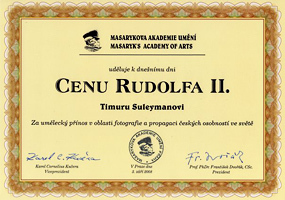 HE GRADUATE TO MOSCOW ACADEMY OF PHOTOGRAPHIES, THE FIRST RUSSIAN PHOTOGRAPHER TO LAUREATE BONUS OF MASARIK'S ACADEMIES ART OF CZECH REPUBLIC, MEMBER OF THE ALLIANCE PHOTOGRAPHERS OF RUSSIA. 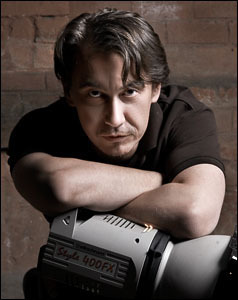 SOME OF HIS WORKS ARE IN THE COLLECTION OF MOSCOW MUSEUM OF MODERN ART.